Try to time your run across this famous East River span when you are least likely to encounter congestion on the pedestrian walkway. Stay in the pedestrian lane. Be careful when it's wet and raining; the bridge walkway can be slick. Be polite and jog in place if you must while tourists pass by. Stay out of the bike lane because even if it looks empty, speeding cyclists can show up very quickly. 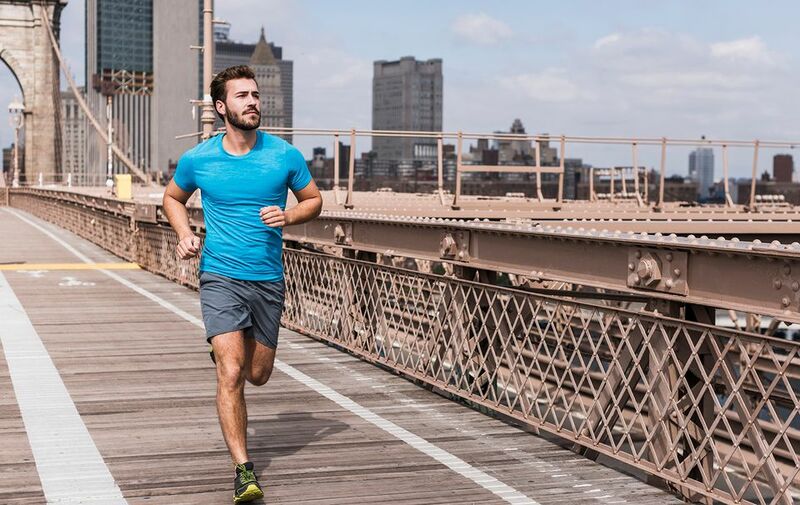 Is Running Across the Brooklyn Bridge Different from Walking Across It? The answer is no—and yes. No, because runners and joggers (and cyclists) share the same wonderful pedestrian pathway, which is elevated above the car traffic. But yes, it's different running than walking the Brooklyn Bridge, and the reason can be summed up in one word: collisions. Every year, it seems, this world-famous bridge attracts more and more tourists and New York locals who want the experience of crossing the Brooklyn Bridge. And although there's a broad walkway, the fact that runners, walkers, tourists, and fast cyclists are all crossing the bridge at the same time in more or less the same place can make for a challenging and even dangerous run. Indeed, runners who regularly include a jog across the Brooklyn Bridge in their workout complain of being accidentally knocked, hit, and of fearing being run over, mostly by high-speed cyclists. To be fair, cyclists also complain about walkers and runners who occupy the bike lane. Accidents happen when one or the other, cyclist, runner or pedestrian, cruises out of their respective lane. Midday during the week, in the mornings before 11 A.M. When the weather is not absolutely gorgeous. If you wish to avoid congestion, then times to avoid include: after work on lovely summer, spring or autumn days; long holiday weekends such as July 4th when New York City is teeming with visitors and tourists, and any day when the weather is great from 11 A.M. until about 7 P.M.
For details on how to navigate getting on and off the Brooklyn Bridge, on both the Manhattan and Brooklyn sides, see How to Walk the Brooklyn Bridge—Manhattan to Brooklyn, Brooklyn to Manhattan. What are the Best Places to Take Photos on the Brooklyn Bridge? What's the Most Scenic Way to Walk the Brooklyn Bridge, Starting from Manhattan or from Brooklyn? Where are Bathrooms Near the Brooklyn Bridge? For general information view a Visitors Guide to Brooklyn, NY.